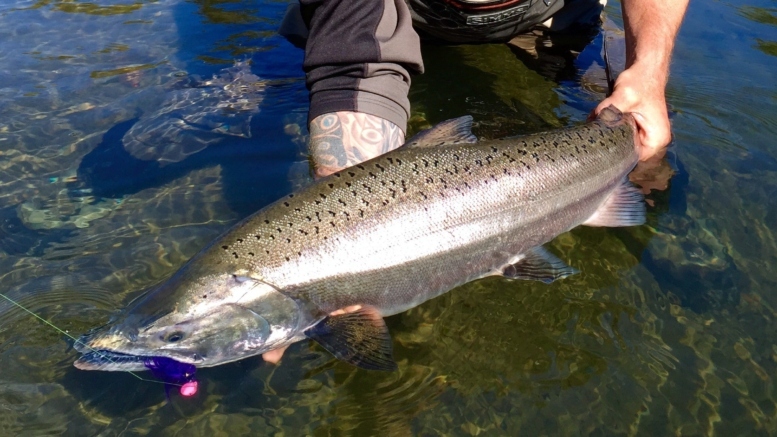 Chinook fishing Humptulips River and North Bay Area 2-2 will be mark-selective for the full recreational season (expected to put an additional 760 wild Chinook on the gravel). Quinault Treaty net schedule for Chinook reduced by one day (expected to put an additional 100 wild Chinook on the gravel). Non-treaty commercial: Due to conflicts with the Commission’s policy to provide a commercial escapement window of three consecutive days per week, the four days originally scheduled during week 46 in Areas 2A/D will be rescheduled to Monday through Thursday in week 45. Why did these particular changes get made? From a location standpoint, when it comes to increasing Grays Harbor Chinook spawner counts, the only place to substantially make up the basin-wide escapement shortfall is in the Humptulips River. So why does the state have to cough up so many more fish than the Tribe? The lopsided conservation burden simply reflects the Chinook catch-sharing disparity in the original plan. That disparity exists because a) sportfishing has the ability to harvest more hatchery fish thru selective fisheries, and b) the large imbalance of Grays Harbor-bound Chinook harvested in ocean fisheries off the Washington coast. While we always want management decisions to reward highly selective fishing methods — there is no denying that coastal fisheries create a large harvest imbalance. In the new plan, WDFW has given up part of the state’s catch share in the bay and the river to offset the pre-terminal harvest disparity in the ocean. Taking away wild retention was the chosen option to reduce the state’s in-basin harvest. Are there other options? Sure… reduced bag, reduced fishing area, or reduced days in the season. But giving up wild retention preserves the maximum possible recreational opportunity without giving up bag, time, or area…. and puts an extra 760 Chinook on the gravel along the way. While certainly a disappointment for those who fish the Humptulips, we hope this explanation makes the bitter pill a little easier to swallow. We also look at this as a healthy example of the State making concessions in the name of escapement and equity with the Co-Managers. We will eagerly watch to see if the Tribes will reciprocate this constructive attitude should imbalances occur elsewhere, and in their favor. 2 Comments on "Full Humptulips Season Going Mark Selective | Co-Managers Actually Collaborate"
This rule was negotiated in the beginning of July?????? The WDFW posted an emergency rule on there website on September the first, opening day. There were no warning signs placed at the usual high traffic areas and boat launches anywhere I was ( 7 or eight places) on the Hump on Sep 2st which was opening day. +1. There was however at least 1 game warden taking fish and writing tickets! I thought it necessary to clarify I did not receive a ticket of any kind on the Hump. Actually I never have received a citation on the Hump and I’ve been a regular for 10 years.